A Gorgeous, 5" Foam Gardenia Flower. Arrange in your hair or in an undo or behind your ear. 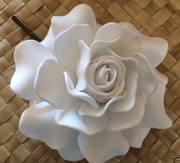 Just like real flowers, each flower is unique as they are hand crafted individually.Feels like real flower too with it's layers of soft velvety-like petals.